Last August (I know, it's been a while) I had the pleasure of being interviewed by Christopher Cummings, author of the blog "Product Management Meets Pop Culture". We talked shop about product management, my role in particular and some of the challenges I'm faced with as a product manager. You can read more about the interview here. 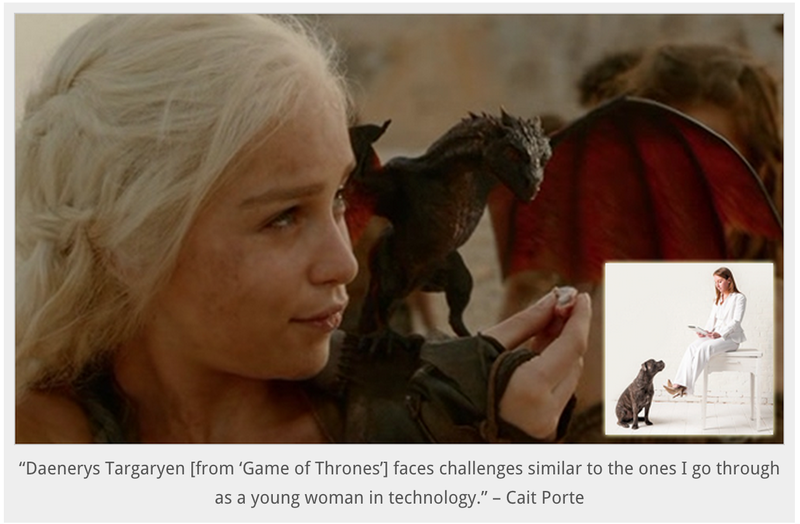 I love the image that Christopher chose to represent the article, a shot of Daenerys Targaryen from Game of Thrones with an inset of a shot of my with Gunner. He asked which character on TV I identify with the most and I chose Daenerys. She's a fearless leader and struggles in similar ways that I do as a female in technology. Christopher did a great job of summarizing my background and how our team makes decisions. I’m going to repurpose some of that here. How did I get into product management? I’m a natural problem solver and an extremely organized person, so I was attracted to how Product Managers uncover what’s going on with the customer and then work with development to solve those problems. What is the PM in Heels? My blog is a great platform for me to voice my opinions and concerns as a Product Manager, as a woman in technology, and as someone trying to navigate their career. I focus on product management and weave career advice into it. How do you decide what to build? I do an impact / ease analysis where I work with customers to understand what the impact to the user would be, then work with development to understand how easy (or difficult) it would be to build. This process gets me talking to customers and developers, and helps to establish credibility among the teams I work with. Prioritization is the most important part of the job. Use this information when building your team! Tell me how you got into product management and why it appeals to you.